This beautiful house, renovated in 2003, would make a wonderful holiday home in the sunshine. . . . This can be your perfect home in the sun! A lovely bright house, completely ready to move . . . Nothing to do to this house, it is completely ready to move into. Just bring your suitcase . 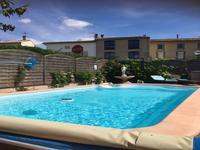 . .
Set in the heart of the village of La Redorte, Aude, this 3 bed house with sunny first floor . . . Occupying the best position on a south facing corner of this beautiful courtyard in the . . . Luxury 3 bedroom apartment in a Canal side village with 2 en-suite bathrooms and another shower room. Spacious quality apartment with huge private wood decked terrace in an 18th century winery 3 . . . This lovely light apartment is ready to move into, just bring your suitcase! Super open plan . . . This development was finished in the year 2000, and is of a high standard. There is a . . . This lovely apartment is one of 29 individually designed apartments in a beautiful building . . .